I woke up fairly early today to take the 1st cable car at 6:00am back down to Stechelberg in order to take the bus to Lauterbrunnen. For those taking the public transportation early in Gimmelwald, do note that the ticket office does not open this early (Gimmelwald ticket office opens at about 8:30am and the Stechelberg opens at 7:00am) and so if you want to buy a ticket from Gimmelwald to Interlaken, it is recommended that you try and buy it the night before. Train from Lauterbrunnen to Interlaken (automated machine in the Lauterbrunnen train station). Unfortunately in this case Post Bus did not turn up to both it's scheduled 6:12 and 7:12 sunday routes. Though this was frustrating as there were no communication at all from the Post Bus company, luckily the nice people from the Schilthornbahn cable car station gave everyone waiting at the bus stop a ride to the Lauterbrunnen station and I was able to squeak into my booked train service from Interlaken to Rome. This experience has definitely taught me a lesson in planning my itinerary and booking international trains in advance. 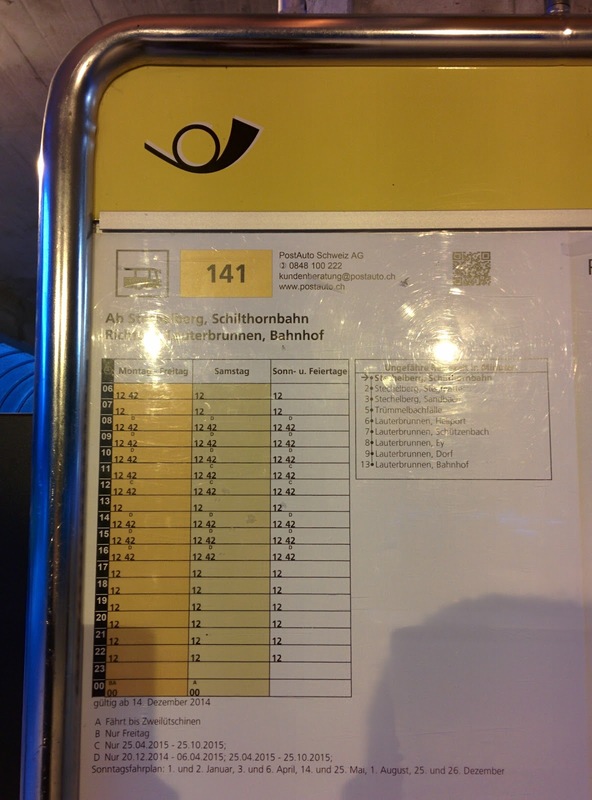 Whilst a 1 hour buffer may be sufficient in the highly efficient public transportation system of London and Paris, this is not enough for the public transportation in the Berner Oberland (particularly Post Bus as I found their cable cars and trains to be pretty efficient as well). As my train makes it's way to Rome, and I have a chance to reflect on the past three days in Berner Oberland, I can really say that along with Paris, Berner Oberland provided me with a unique experience and really took me outside of my comfort zone physically. Although, much of the day was spent on the train, this was made up bythe fact that I managed to get a free upgrade (whilst booking early) to business class and was able to enjoy a more spacious and comfortable ride to Rome. During this ride, I also saw how shameless people could be, as I noticed a couple of people trying to sit in the business class section after being repeatedly told by people that they were sitting on seats someone had already booked and that their seat was in another section of the train. Arriving at Rome, I was surprised by the difference between Rome and the cities I've been to so far in this trip. The easiest way to describe it was a feeling of organised chaos and getting lost (whilst it is easy to hit the ground running in London, Paris and Berner Oberland). It took a while but I managed to find my way though to buy the 3 day Rome Pass (free entry into two attraction and unlimited public transportation) inside the Roma Termini train station and take the tube to my hostel Dreaming Rome. Arriving at Dreaming Rome, I met the passionate, energetic and friendly hosts of the hostel who put a lot of effort (compared to other hostels I've stayed at) by not only providing me with some recommendations in Rome, but also getting other guests in the hostel together in the evening and sharing a dish of pizza (dinner is usually around 8:30pm or later). If you want a social and friendly hostel, this place is definitely recommended.